Tens of millions of Americans braved Arctic-like temperatures on Thursday as low as minus 56 degrees Fahrenheit (minus 49 Celsius) that paralysed the US Midwest and were blamed for at least 21 deaths. Officials across multiple states linked numerous deaths to the frigid air. 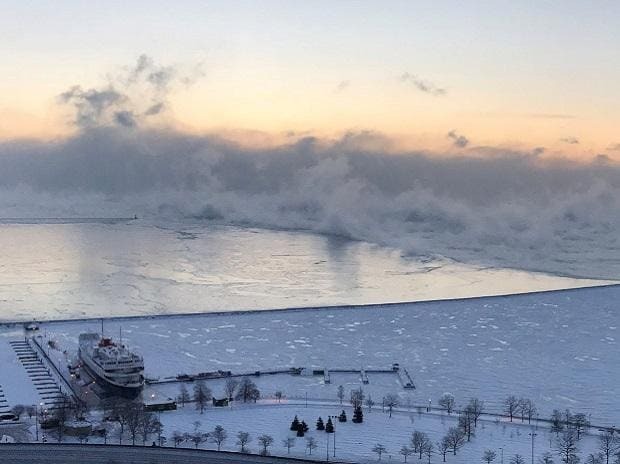 The death toll rose from a previous 12 after at least nine more people in Chicago were reported to have died from cold-related injuries, according to Stathis Poulakidas, a doctor at the city's John H. Stroger Jr. Hospital. A University of Iowa student was found unresponsive on campus on Wednesday and died, according to university officials. Police told a local television station they believed the cold played a factor in his death. The wind chill at the time officers found Gerald Belz, 18, was minus 51 F (minus 46 C), according to the National Weather Service. "Thereâ€™s just no way if youâ€™re not near a heat source that you can survive for very long out in weather like this," Evans told the Chronicle-Telegram newspaper. It has been more than 20 years since a similar blast of frigid air covered a swath of the US Midwest and Northeast, according to the National Weather Service. Homes and businesses used record amounts of natural gas to fight the cold, according to financial data provider Refinitiv. Utilities appealed to consumers to conserve energy to avoid power outages. In Detroit, General Motors Co suspended operations at 11 Michigan plants to cut natural gas consumption. Fiat Chrysler Automobiles NV canceled a shift on Thursday at two of its plants. Snow and ice created treacherous travel conditions, with 26 road collisions reported within two hours on Thursday in eastern Iowa's Johnson County, emergency communications center chief Tom Jones told the Iowa City Press-Citizen. For the second day in a row, the intense cold and windy conditions forced US airlines to cancel more than 2,000 flights. Chicago was hardest hit, with Oâ€™Hare International Airport experiencing over 700 cancellations, according to the FlightAware tracking site. More than 30 record lows were shattered across the Midwest. Cotton, Minnesota, had the lowest national temperature recorded early on Thursday at minus 56 F (minus 48 C), before the weather warmed up, the weather service reported.